B | S&P Canada Ventilation Products, Inc. Exhaust air to over 32,000 CFM with static pressure capabilities up to 8-1/2" w.g. The Backward Inclined Utility Vent Set with ULTRAFAN-PAK fan wheels are versatile, quiet, and energy efficient. These utility sets are the best selection for many industrial, commercial and institutional projects. Typical applications include hood exhaust, welding fume exhaust and flammable gas exhaust. Ventilation of theaters, restaurants, stores, hotels, kitchens, gymnasiums, laundry rooms, lavatories and locker rooms are other common applications for utility sets. ULTRAFAN-PAK fans by S&P are available in 13 sizes with wheel diameters from 7-3/4" through 36-1/2". 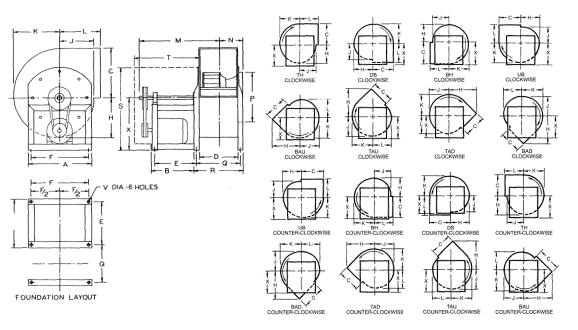 Wheel diameters are readily recognized by the model number. For example, Model B-105 has a 10-1/2" diameter wheel and Model B 330 has a 33" diameter wheel. ULTRAFAN-PAK Class I fans deliver up to 26,000 cubic feet of air per minute (CFM) at static pressures (SP) up to 5" W.G. Class II fans deliver up to 32,000 CFM at SP up to 8-1/2" w.g. 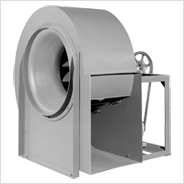 For small or medium size general ventilation applications ULTRAFAN-PAK utility sets are the ideal choice. These easy to select, easy to install fans come prepackaged from the factory. Each self-contained unit includes the motor and adjustable drive as well as the fan assembly. 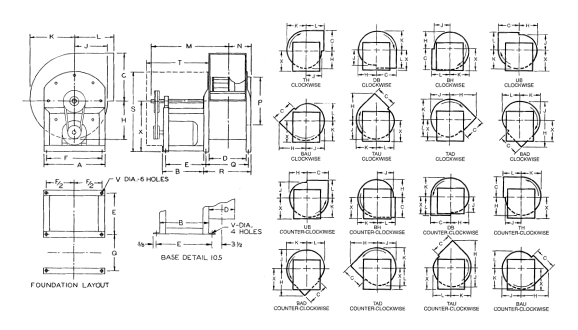 105 0.0387 HP 509 to 2671 8-1/2"
122 0.1009 HP 686 to 4118 8-1/2"
135 0.1567 HP 839 to 5035 8-1/2"
150 0.2575 HP 1024 to 5888 8-1/2"
165 0.4142 HP 1248 to 7176 8-1/2"
182 0.6444 HP 1519 to 8735 8-1/2"
200 1.0139 HP 1854 to 10199 8-1/2"
222 1.8739 HP 2262 to 13004 8"
245 3.0246 HP 3458 to 15907 8"
270 3.15 HP 3352 to 16760 8-1/2"
300 5.33 HP 4136 to 21714 8-1/2"
330 8.59 HP 5008 to 25040 8-1/2"
365 13.01 HP 6128 to 32172 8-1/2"
105 12-7/8" 13" 11-3/4" 8" 14-1/4" 10-3/4"
122 16-3/8" 13-1/2" 13-1/4" 9-5/8" 13-1/2" 14-3/4"
135 17-5/8" 13-1/2" 14-5/8" 10-3/4" 13-1/2" 16"
150 19-1/4" 15-1/2" 16-1/4" 11-3/4" 15-1/2" 17-5/8"
165 21-3/8" 15" 17-3/4" 13" 15-1/2" 19-3/4"
182 23-1/8" 17" 19-5/8" 14-1/4" 17-1/2" 21-1/2"
200 25" 17" 21-1/2" 15-7/8" 17" 23-3/8"
222 27-3/8" 16-1/2" 24" 17-3/8" 17" 25-3/4"
245 30-1/4" 16-1/2" 26-1/4" 19-1/4" 16-3/4" 23-5/8"
270 33" 16-1/2" 29" 21-1/4" 16-1/2" 26-1/4"
300 36-1/4" 16-1/2" 32-1/4" 23-3/8" 16-1/2" 29-1/2"
330 39-1/2" 21-3/8" 35-3/8" 25-7/8" 21-5/8" 33-1/8"
365 43-1/8" 21-3/8" 39-1/4" 28-1/2" 21-5/8" 36-7/8"
105 7-7/8" 6-3/4" 9-1/8" 8-1/16" 13-1/4" 8-7/8" 9-5/8" 7-1/8"
122 10-1/8" 8-1/2" 11-1/2" 10-1/2" 16-5/8" 10-3/4" 12-1/2" 9-1/8"
135 11-1/8" 9-3/8" 12-5/8" 11-3/8" 18-1/4" 11-7/8" 13-3/4" 10"
150 12-3/8" 10-3/8" 14-1/8" 12-3/8" 20-1/8" 13-1/4" 15-1/4" 11-1/8"
165 13-5/8" 11-3/8" 15-1/2" 13-3/8" 21-7/8" 14-5/8" 16-3/4" 12-1/4"
182 15" 12-5/8" 17-1/8" 14-5/8" 24-1/8" 16" 18-1/2" 13-5/8"
200 16-1/2" 13-3/4" 18-3/4" 15-3/4" 26-3/8" 17-5/8" 20-3/8" 14-7/8"
222 18-1/4" 15-1/4" 20-7/8" 17-1/4" 29" 19-1/2" 22-5/8" 16-1/2"
245 20-1/8" 16-7/8" 23" 19-7/8" 32-1/2" 21-1/2" 24-7/8" 18-1/4"
270 22-1/8" 18-1/2" 25-1/4" 21-1/2" 35-3/8" 23-5/8" 27-3/8" 20"
300 24-5/8" 20-1/2" 28-1/8" 23-5/8" 39-3/8" 26-3/8" 30-1/2" 22-1/2"
330 27-1/8" 22-1/2" 30-7/8" 25-5/8" 43" 28-7/8" 33-1/2" 24-3/8"
365 30" 24-7/8" 34-1/8" 28" 47-3/8" 32" 37-1/8" 27"
105 19-5/8" 6" 12-7/8" - - 20-1/2"
122 23-7/8" 6-3/8" 13-1/4" 11-1/4" 12-3/4" 25-1/4"
135 24-3/8" 7" 14-1/2" 12-3/8" 13-7/8" 25-7/8"
150 26-7/8" 7-1/2" 16-1/8" 13-7/8" 14-7/8" 25-7/8"
165 27-1/2" 8-1/2" 17-7/8" 14-1/2" 17" 30-1/8"
182 30-5/8" 9-1/8" 19-5/8" 15-3/4" 18-1/4" 33-3/8"
200 31-1/2" 10" 21-1/2" 17-7/8" 20-1/8" 36-1/4"
222 32-3/4" 10-5/8" 23-7/8" 19-3/8" 22-5/8" 39-3/4"
245 33-5/8" 11-3/4" 26-3/8" 21-1/4" 24-1/2" 42-7/8"
270 34-5/8" 12-5/8" 29" 23-3/4" 26-1/2" 47"
300 36" 13-3/4" 32-1/4" 26" 28-3/4" 51-7/8"
330 41-3/8" 15" 35-3/8" 28-3/8" 31-1/8" 58-1/2"
365 43-1/4" 16-1/4" 39" 31" 33-3/4" 63-3/4"
105 16-3/8" 15" 11-3/4" 8" 13-1/2" 14-3/4"
122 16-3/8" 15-1/2" 13-1/4" 9-5/8" 15-1/2" 14-3/4"
135 17-5/8" 15-1/2" 14-5/8" 10-3/4" 15-1/2" 16"
150 19-1/4" 15-1/2" 14-5/8" 10-3/4" 15-1/2" 17-5/8"
165 21-3/8" 21" 17-3/4" 13" 21-1/2" 19-3/4"
182 23-1/8" 21" 19-5/8" 14-1/4" 21-1/2" 21-1/2"
200 25" 21" 21-1/2" 15-7/8" 21" 23-3/8/"
222 27-3/8" 22-1/2" 24" 17-3/8" 23" 25-3/4"
245 30-1/4" 22-1/2" 26-1/4" 19-1/4" 22-3/4" 23-5/8"
270 33" 21" 29" 21-1/4" 21-1/8" 26-1/4"
300 36-1/4" 23" 32-1/4" 23-3/8" 23-1/8" 29-1/2"
330 39-1/2" 23" 35-3/8" 25-7/8" 23-1/4" 33-1/8"
365 43-1/8" 23" 39-1/4" 28-1/2" 23-1/4" 36-7/8"
135 11-1/8" 9-3/8" 12-5/8" 11-3/8" 18-1/4" 11-7/8" 133/4" 10"
105 22-3/8" 6" 12-7/8" - - 25-1/4"
122 25-3/8" 6-3/8" 13-1/4" 11-1/4" 12-3/4" 25-1/4"
135 25-7/8" 7" 14-1/2" 12-3/8" 13-7/8" 25-7/8"
150 27" 7-1/2" 16-1/8" 13-3/8" 14-7/8" 27-5/8"
165 34-1/8" 8-1/2" 17-7/8" 14-1/2" 17" 30-1/8"
182 34-3/4" 9-1/8" 19-5/8" 15-3/4" 18-1/4" 33-3/8"
200 35-5/8" 10" 21-1/2" 17-7/8" 20-1/8" 36-1/4"
222 38-3/8" 10-5/8" 23-7/8" 19-3/8" 22-5/8" 39-1/4"
245 40-1/2" 11-3/4" 26-3/8" 21-1/4" 24-1/2" 42-7/8"
270 39-5/8" 12-5/8" 29" 33-3/4" 26-1/2" 47"
300 42-5/8" 13-3/4" 32-1/4" 26" 28-3/4" 51-7/8"
330 45" 15" 35-3/8" 28-3/8" 31-1/8" 58-1/8"
365 46-1/4" 16-1/4" 39" 31" 33-3/4" 63-3/4"